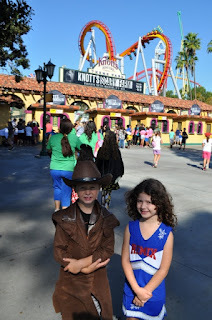 With Knott's Scary Farm under way, I had two disappointed children wondering why they can't have fun with Mom and Dad at Knotts! Little did they know that Knott's Berry Farm was surprising them with a trip of their own to Knott's not-so-scary Farm, Knott's Spooky Farm. 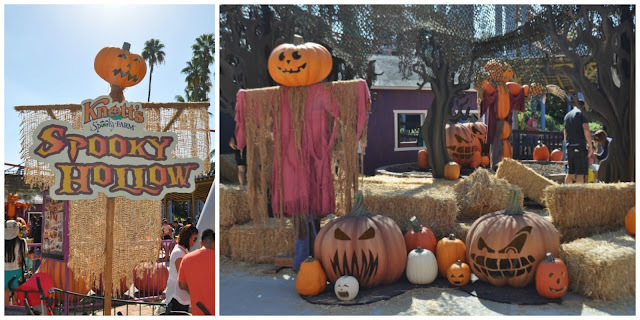 Knott's Spooky Farm(previously known as Camp Spooky) has expanded into the rest of the park with new activities and fun! Trick or Treating? Check! Kid friendly shows? Check! Creepy Crawlies? Check! Photo Ops? Check! Karaoke? Wait, what??? Yup! CHECK! Of course we all know that Knott's has great fun and affordable entertainment, rides and food! 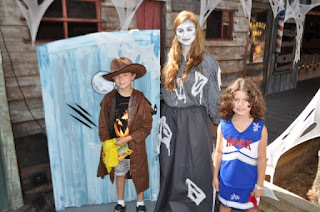 Did you know that there is no extra cost for Knott's Spooky Farm? It is included in their everyday prices. One thing you might be aware though, the park closes at 5:30 or 6:00PM to get ready for Knott's Scary Farm each night. Please check hours before making your plans by checking them here. Are costumes allowed? Kind of. Adults are not allowed but kids are encourage and even have their own costume contest! My kids costumes and goody-bags in hand were eager to go. As you enter the park, be sure to receive one of the special Spooky Farm maps that will point out the new features especially for our youngsters. 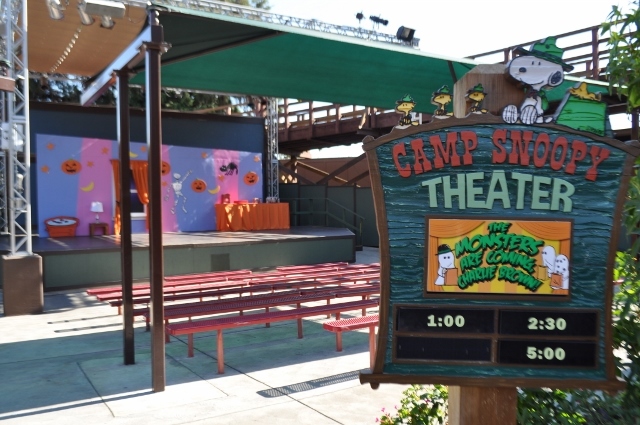 Unlike in years past, the only Camp Snoopy activity is the wonderful Camp Spooky show in the Camp Snoopy Theatre. I love how they include the audience in their fun Halloween shows. My kids always feel so special when they get a chance to go on stage with the cast! We rode a few of the rides in Camp Snoopy and looked at what was next. Just past Camp Snoopy, Spooky Hollow invaded the area next to Jaguar. What is Spooky Hollow? If you want your Halloween photo-ops, this is the place! There are characters and jack-o-lanterns galore! There was even a maze that included a turning tunnel! 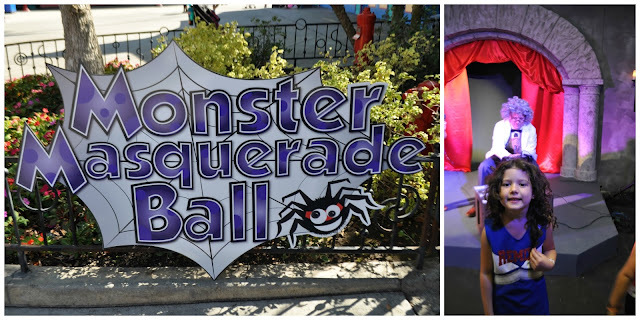 Around the corner from Spooky Hollow near the Log Ride was the Masquerade Ball. No this wasn't a dance hall but there were plenty of kids dancing! Mask making and kids karaoke fill the room. My kids loved listening to the music but weren't quite ready to join in. After checking the map, we headed over to Ghost Town. My kids loved the skeletons and spooky decorations along the way. It made them feel very grown up to see spooky things in the safe daylight. It would be a very different story at night. There were 6 stations of treats. Ring the doorbell or knock and you might get more than you bargained for. Each door was manned(and woman-ed) by ghosts and ghouls. Sweets and small toys were loved by all. 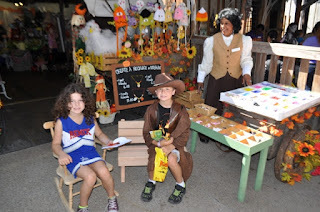 There were adorable hand-made crafts and jewelry to make the day even more memorable. As we were walking towards the Creepy Crawly Cabin, my kids dared each other to go into the old cemetery. I don't care how old I am, I always stand on the grave to "feel" the heart-beat! As the day was winding down, we located the Cabin, (it is next to the cemetery by the Barn). Beware that it doesn't have a sign saying its name. 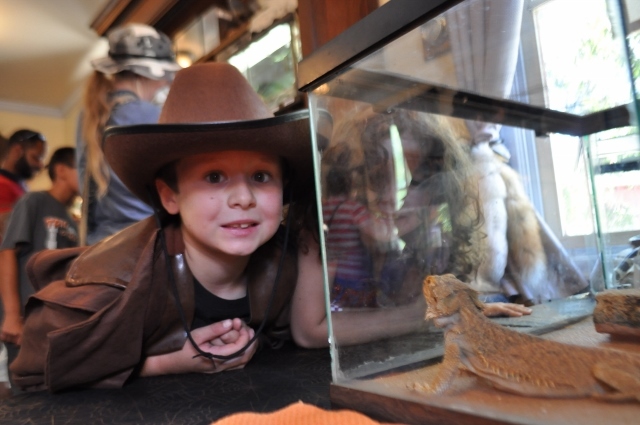 The kids were allowed to hold and look at live toads, snakes, spiders, lizards and more! After a few more rides, it was time to head home. 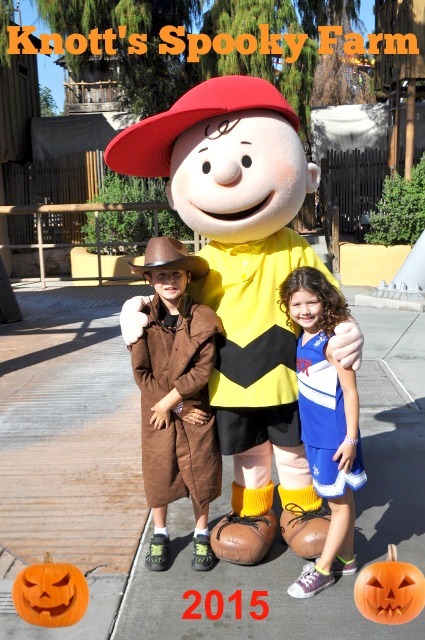 Thank you Knott's Berry Farm for a wonderful family day at Knott's Spooky Farm! We love the family atmosphere that caters to the whole family.